Ad from Mātr̥bhūmi vārṣikappatippȧ, print journal. Calicut : Mathrubhumi Ptg. & Plg. Co., 1967. From the University of Chicago Library. 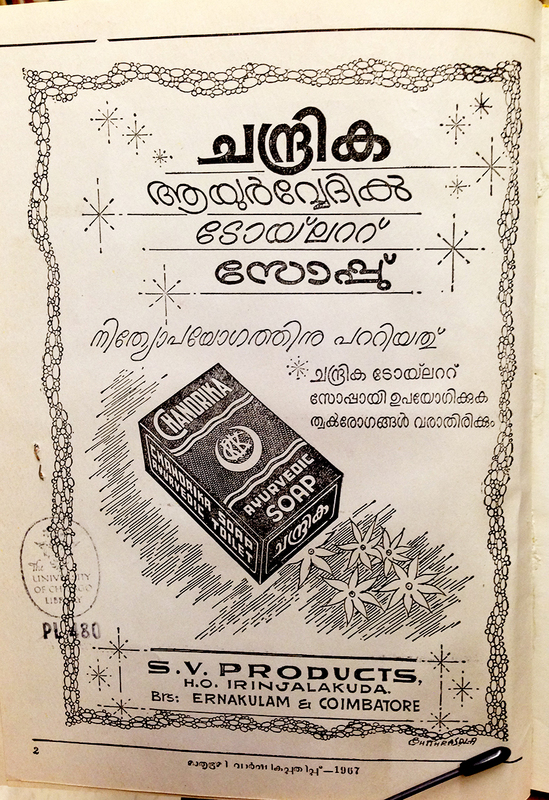 ചന്ദ്രിക Chandrika brand Ayurvedic soap. ആയുർവേദിക് seems to be a common rendering/spelling for Ayurvedic, but in this ad, ആയുർവ്വേദിൿ appears to be more accurate? “Toilet soap”, ടോയ്ലറ്റ് സോപ്പ് , follows. I’m really enjoying the backward- and forward-slanting variations and the large counter forms in this casual style. This brand is still around today, and it appears that the packaging hasn’t changed very much.